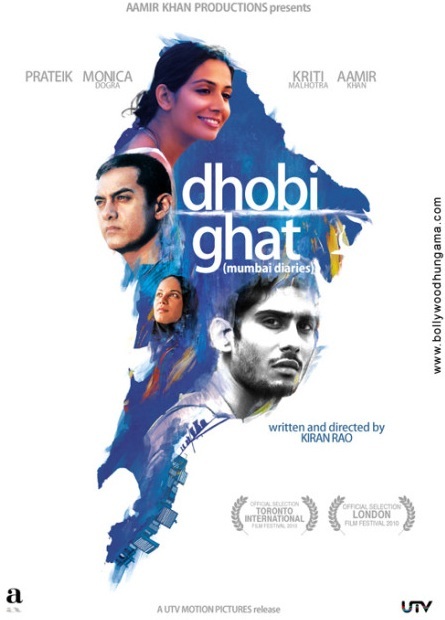 A raw yet assured directorial debut by Kiran Rao, Dhobi Ghat is more a documentation of four different lives even as they mingle and then scatter into their isolation, rather than an attempt at telling a singular dramatic story. Contrived situations are rare here. Arun (Aamir Khan) is a reclusive painter, who stumbles upon a set of video tapes of Yasmin (Kriti Malhotra), the (newly-wed) previous occupant of the room Arun has recently moved to. Then there is Munna (Prateik Babbar) - washer man by day and a municipality-employed rat-killer by night, who is befriended by Shai (Monica Dogra), an American banker on a sabbatical, indulging in her passion for photography. There is a lingering in the proceedings, which is outlined well by Gustavo Santaolalla's score. Glimpses of Mumbai life are insightful, the film begs for more of it. We do get lively street children frolicking when they realize they are been recorded in Yasmin's camera, a family caught in the frenzy of the morning rush - a rapidly made breakfast, a man tucking in his shirt, pulling at his school uniform clad son's hand, and forcing open the door, all in one motion. The gunny-bag draped Gateway of India, the rain-drenched Marine Drive, a leaking roof, all convey soft images, seldom seen on a cinema screen. The cribbing would mostly be for the lack of punch in the story itself, which replicates the continuity of life, but droops in intensity. We do get a very real, yet brief love triangle, a tragedy revealed - whose effect on Arun is more than on the audience. So, while the visuals and characters have a soothing quality, there is lively Mumbai city literature ( "We have 24 hours water. "), the effect in totality, is of delightful glimpses in to lives in the city across classes. Certainly worth experiencing, the film has top-notch performances, Aamir Khan succeeds in conveying the character, shedding the commercial star drab. We only wish Arun was more vulnerable and devastating. Prateik Babbar gets that vulnerable skin in Munna which he uses to great effect. Monica Dogra is a perfect casting choice for her cosmopolitan character, a confident act. Kriti is good as Yasmin, we wish she was more haunting, considering the pathos of her character. We say, no grumbling, a great promising start for Rao, and more risk and verve in the story next time. Munna runs right through the middle of the stuffy Mumbai traffic after an elusive car, and not for one moment does it seem made up. The one masterstroke scene in the film.